Frederick York Wolseley was born in Ireland in 1870. At the age of 17 he moved to Australia where he set up the Wolseley Sheep Shearing Company Limited which manufactured sheep shearing equipment. He was to return to England in 1889 where he produced his first car, this being a three wheeler. Only one example of this model was ever built, but Wolseley constructed a second model in 1897. In 1901 The Wolseley Tool & Motor Car Company Ltd was founded, and a factory was acquired in Birmingham for the sole purpose of producing cars. It is interesting to note that in 1905 a Wolseley employee named Herbert Austin left the company to form his own car manufacturing business, the Austin Motor Company Ltd., also based in Birmingham. Wolseley went on to become one of the largest car manufacturers of the Edwardian period. In addition to cars, the company also produced commercial vehicles, marine and aero engines. Wolseley supplied its commercial vehicles to the military during the First World War, for the duration of which, no Wolseley cars were made. Car production recommenced in the early 1920's and in 1927 Wolseley became part of the William Morris group of companies. From this point the Wolseley range of cars went up market somewhat with models being marketed as more of a luxury car than had been previously the case. These new models became increasing popular with the more financially well off family motorist, and Wolseley soon gained a reputation for building not only high quality, but at the same time reliable cars. During the Second World War Wolseley were completely focused on producing armaments for the military, but car manufacture was to restart after the end of the hostilities. In 1949 car production was moved to Cowley near Oxford and by 1952 Wolseley became part of the BMC (British Motor Corporation) group, and were producing luxury versions of the standard BMC range. These models still featured the characteristic Wolseley grill with its illuminated badge that had first appeared in 1932 and featured on all models until the Wolseley name was dropped in 1975. Wolseley cars were to become very popular with Britains police force during the 1950's and were widely used by them throughout the country. In 1968, BMC, after merging with Jaguar and the Leyland Motor Company, became the British Leyland Motor Corporation, which in turn was taken over by the Rover Group. The last car to carry the Wolseley name was the 2200 in 1975. The Wolseley 4/50 saloon, powered by an all-new single overhead camshaft engine, was launched in October 1948 at the same time as the larger six-cylinder 6/80. 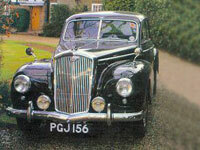 The Wolseley 6/80 saloon was launched in October 1948, alongside the smaller four cylinder 4/50 saloon to which it was very similar in appearance.